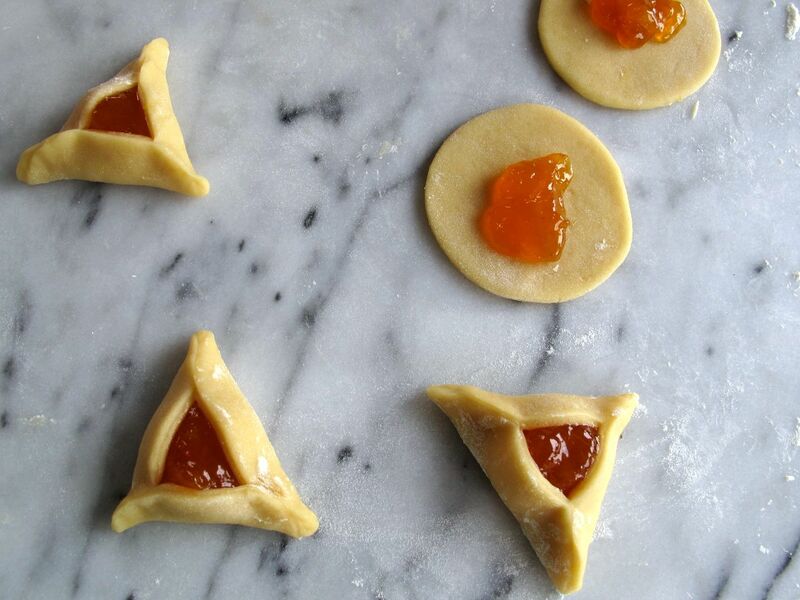 Every Winter/Spring since I’ve been writing this blog, the Jewish holiday of Purim has passed me by and I’ve missed my chance to make the traditional cookies that I loved so much as a child: hamantaschen. In other words, I’ve forgotten about the existence of Purim every year until it’s too late — not really too late to make hamantaschen (one could argue that it’s never too late to bake holiday cookies, even if you’re just getting a 364-day head-start on the next year), but definitely too late to photograph + write about them for you. 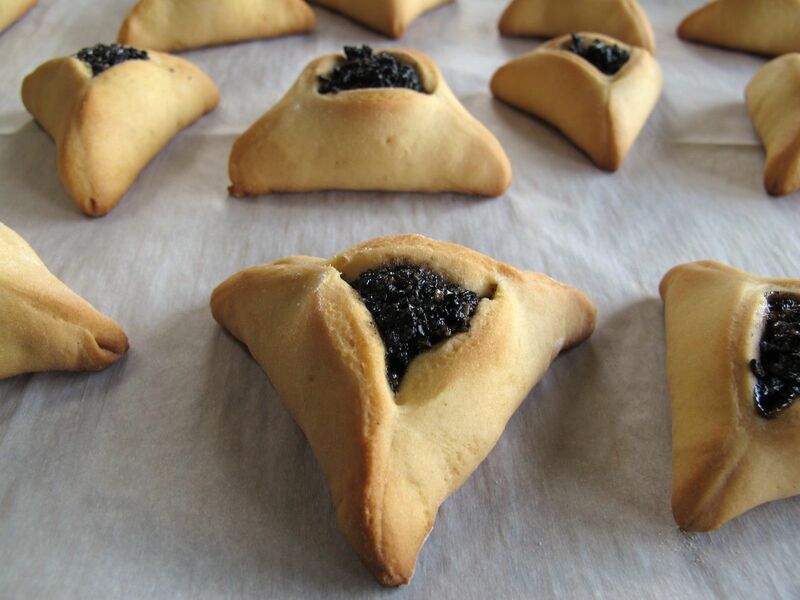 And instead of using the traditional hamantaschen filling of poppyseed “goop” (for lack of a better word…), I chose a very non-traditional seed that I love even more than poppyseeds: black sesame. 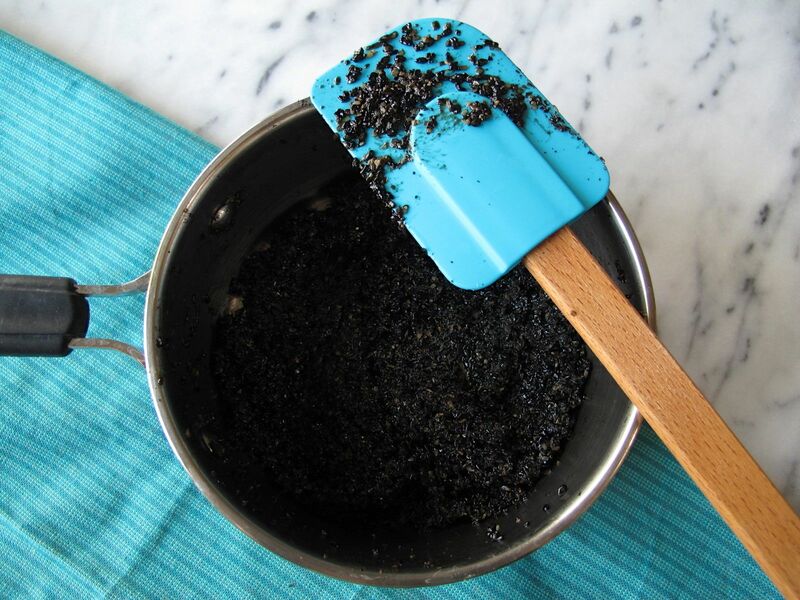 Black sesame might sound like the sort of ingredient you’d usually find in a savory context, but mix it with sugar or honey — and, unexpectedly, vanilla — and you can make all sorts of delectable desserts, which are not too sweet and which have the loveliest, slightly burnt, nutty edge of toasted sesame. I originally planned on just tossing some black sesame seeds, honey, and lemon zest into my food processor to concoct this filling, but then I took a look at how a bunch of other blogs out there have made homemade poppyseed filling (which, by the way, is also sold in cans — that’s how we always made poppyseed hamantaschen as kids). 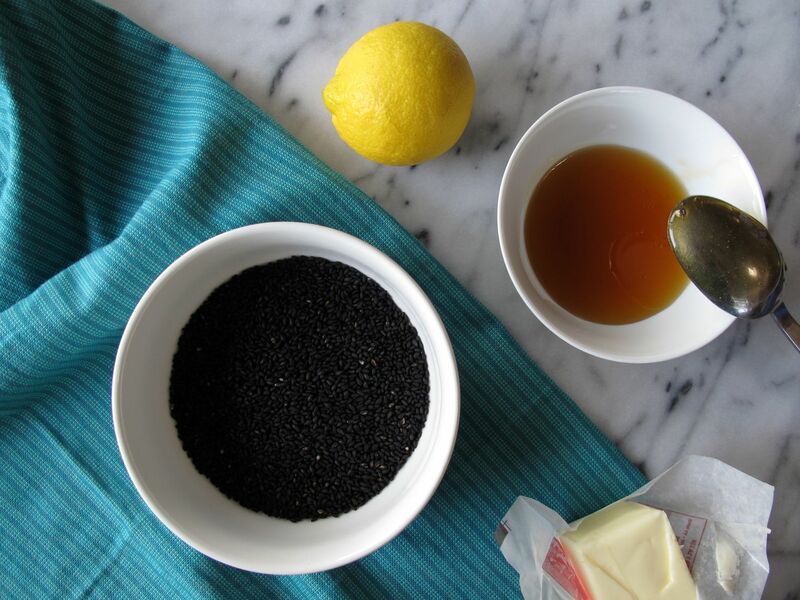 Since most people simmered down their poppyseed goop in a little milk, or even whisked in tempered eggs to make a kind of custard, I decided to do something similar with milk, honey, sesame seeds, vanilla, and lemon zest, and to stir in a little butter at the end, for extra richness. The filling turned out wonderfully: sweet, but not too sweet, sticky, but not too goopy. 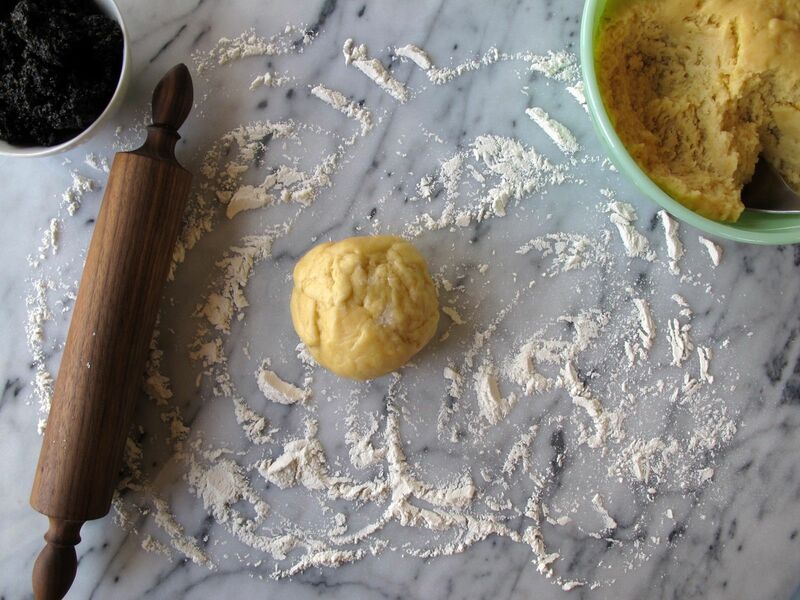 The dough on the other hand… This is my family recipe (which is not to say that it’s original to my family — just that it’s the one my mom and sister used back in the day, and I don’t know who/where it’s from originally). But I think it called for way too much baking powder (or I made a mistake in writing it down? ), so when the dough baked up, it became far too puffy and cakey. My suspicions about the amount of baking powder were confirmed by my second test-batch (not photographed), where I halved the baking powder — as reflected in the recipe below — and they turned out much, much better. 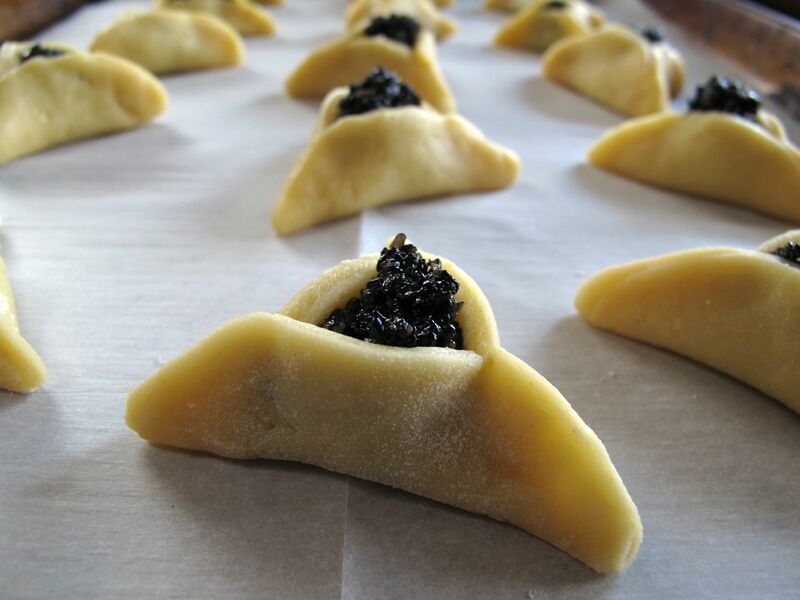 The dough recipe below makes 70-80 small hamantaschen, but the recipe for black sesame filling will make enough for just about half of that (about 35), so you can either double the recipe for black sesame filling, or do what we did, and fill the other 40 cookies with your favorite jam! 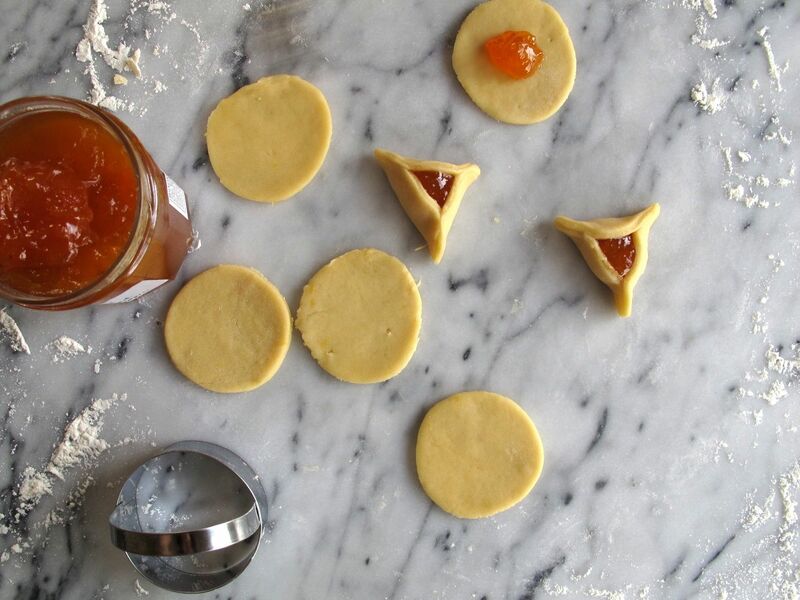 Storebought canned fillings for hamantaschen are a little less like jam, and more like what you’d use to fill a fruit pie, but jam works too. 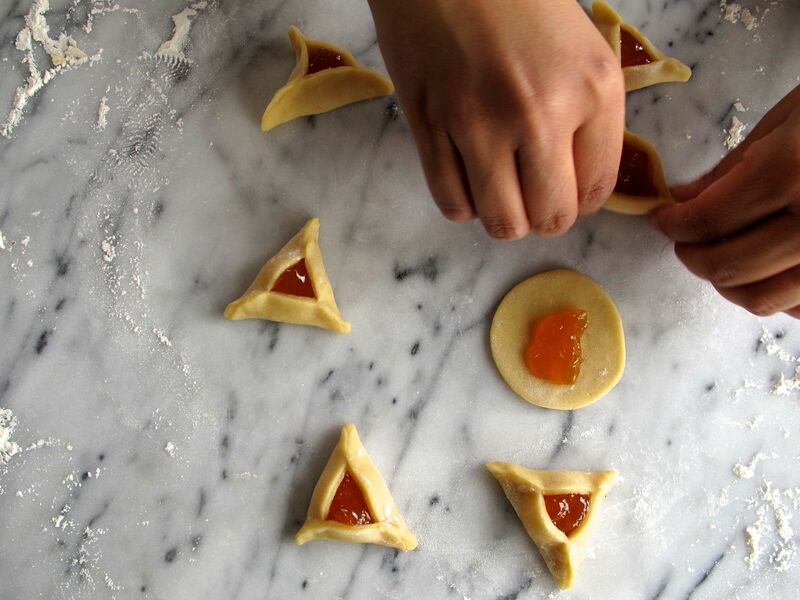 Traditional hamantaschen flavors besides poppyseed include apricot (which we used here), prune, raspberry, and apple — but you can really fill them with just about anything. Day 1 Active & Total time: 15 min., then overnight; Day 2 Active & Total time: 1 hour. 1. 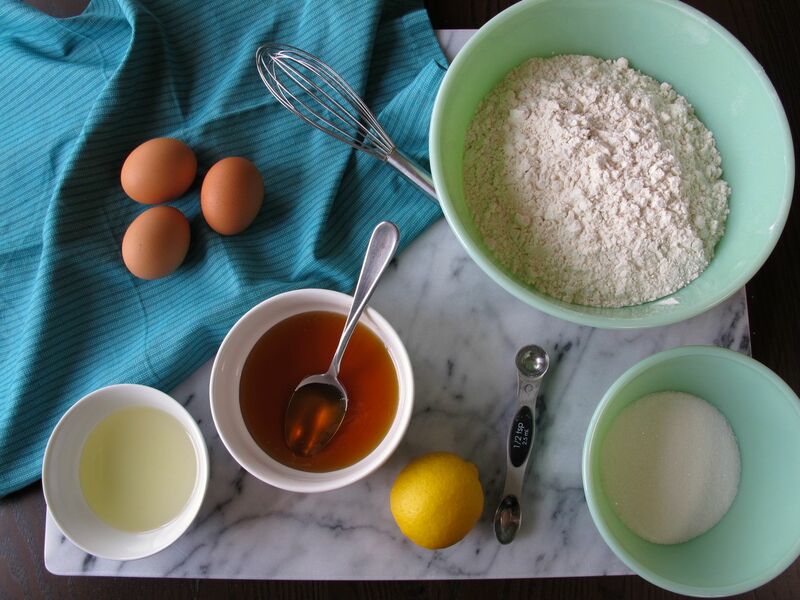 In a large bowl (or in the bowl of a stand mixer), whisk together the flour, baking powder, and salt. 2. 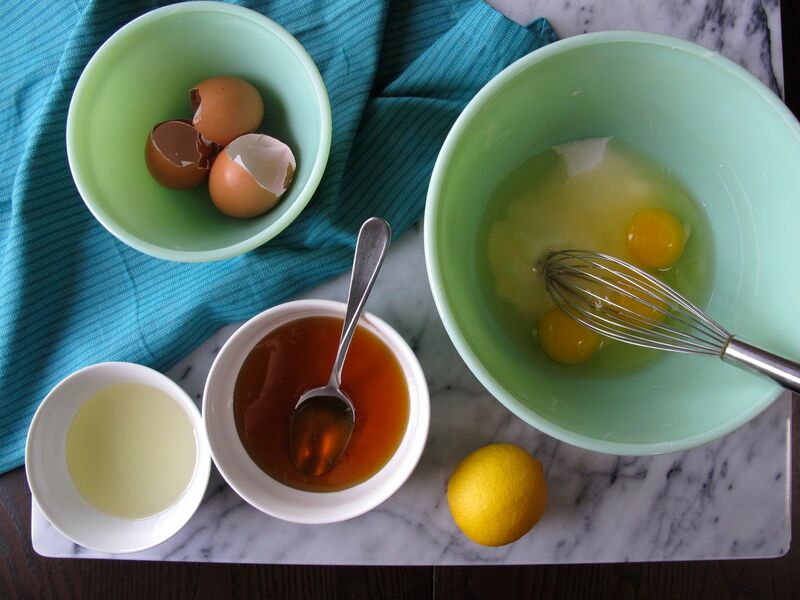 In a medium bowl, whisk together the eggs and the sugar, then whisk in the honey, vegetable oil, water, and lemon/orange zest. 4. Cover and refrigerate dough overnight. 5. Pre-heat the oven to 350 degrees. Let the refrigerated dough warm up for 5-10 minutes if necessary. 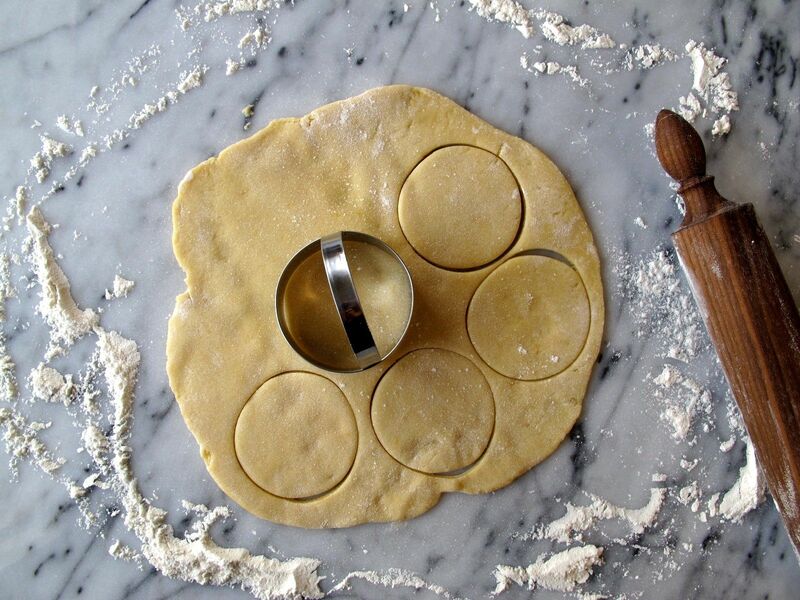 On a lightly floured surface, roll out a small section of the dough to about ¼” thick, and use a glass or cookie cutter, about 2½” in diameter, to cut the dough into circles. 6. Place a heaping ½ tsp. 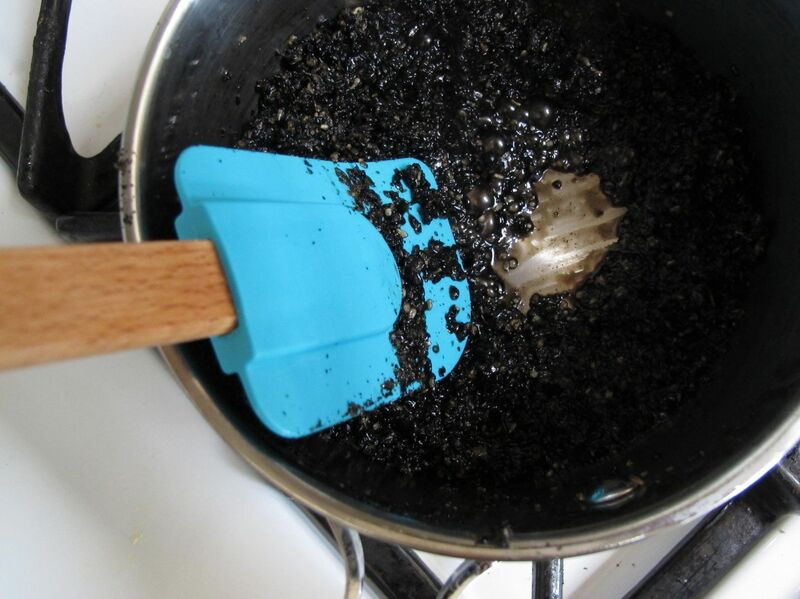 of sticky black sesame filling — or a scant ½ tsp. 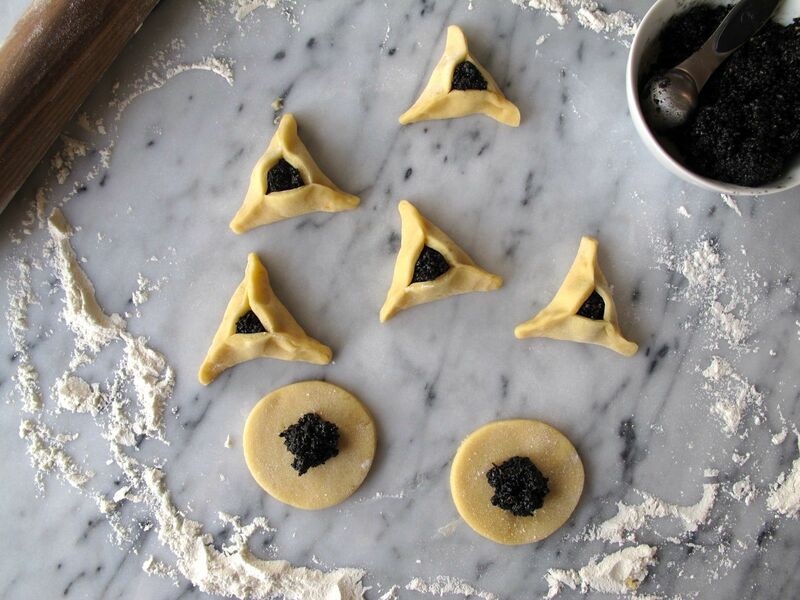 of a softer jam — into the center of each circle, and fold in dough to form a triangle, pinching the corners to seal them shut. Place on a parchment-lined (or greased and floured) baking sheet, and bake for 14-16 minutes. 1. 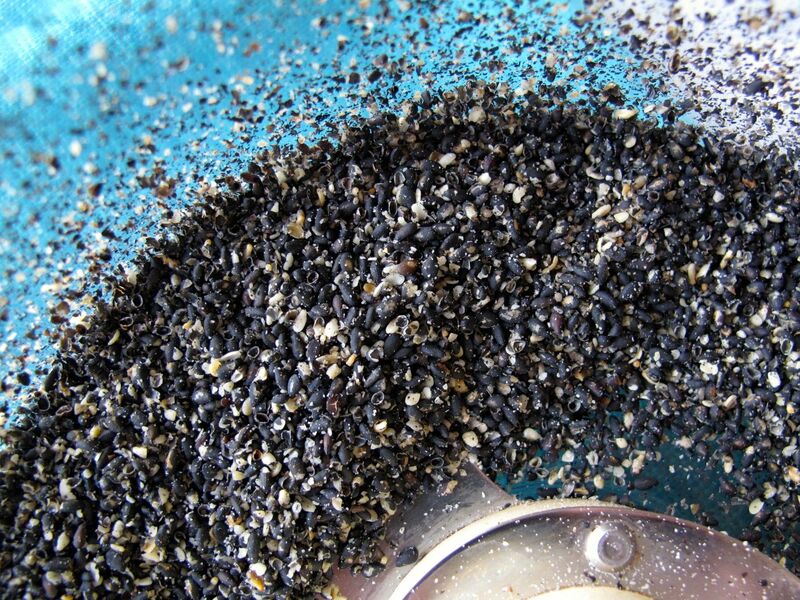 Lightly grind the black sesame seeds in a food processor using the “pulse” function: you want about ⅔ of them broken up, and ⅓ of them still whole — about 40 pulses should do it. 2. In a small saucepan, combine the milk and honey over low heat, stirring until the honey dissolves into the milk. Then add the ground sesame seeds and bring to a simmer (still over low heat — or the lowest heat at which you can get it to simmer), and simmer for 7-10 minutes, stirring frequently. While it’s simmering, add the lemon zest and vanilla. 3. Once the mixture has thickened considerably — or as desired, stir in the butter until it melts, cooking it for another minute or so. 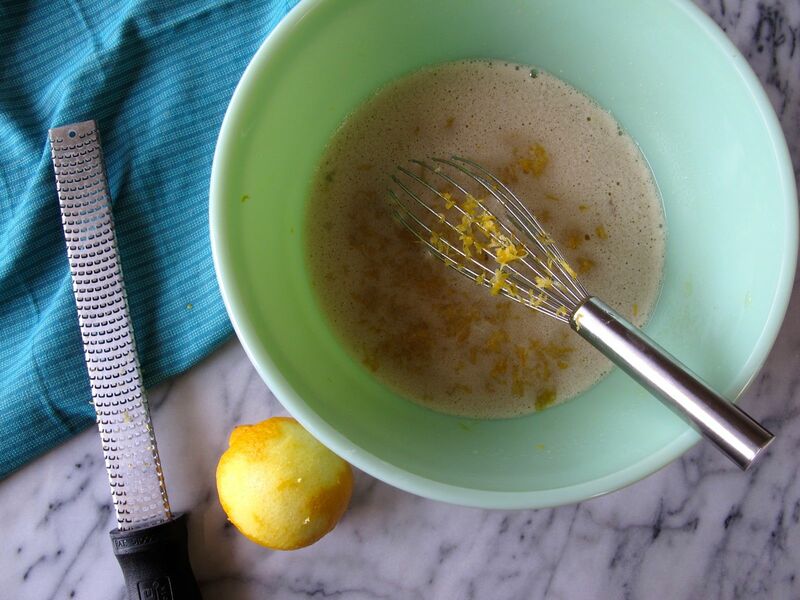 Optionally add a small squeeze of fresh lemon juice. 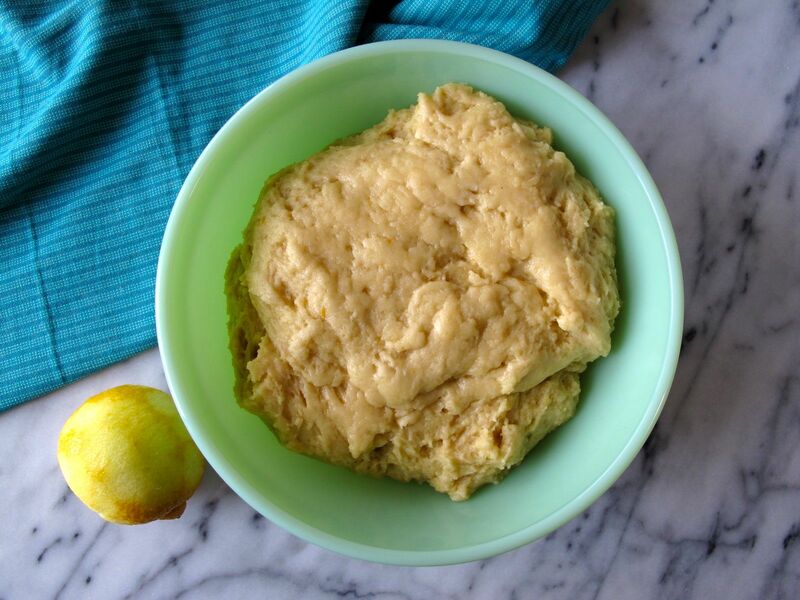 Then remove from the heat and let cool to room temperature — you can also make this a day ahead, when you first make the dough, and cover and store in the fridge. They look amazing! How on earth do you not eat them all? Thanks! And good question! 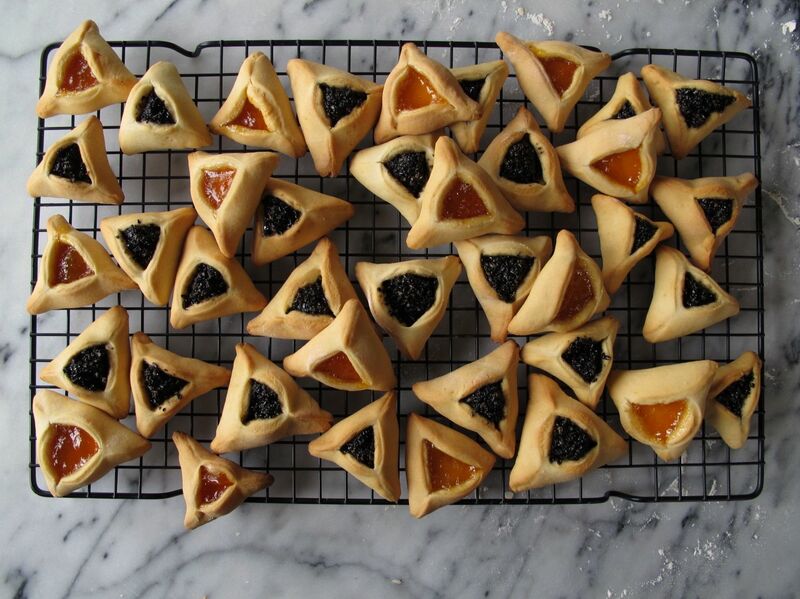 Paula and I each brought containers of them to work (and none of our co-workers had ever heard of hamantaschen!). They look amazing, like jewels! Isn’t it strange how childhood memories and routines get forgotten, only to resurface again, stronger than ever? For me it was really the arrival of my own children that made me remember so many dishes and traditions. I know, and in this case I guess I really did forget the recipe, even though I’d written it down from my sister/mom about 15 years ago, but apparently with the wrong amount of baking powder… and then it took me that many years to finally bake them myself! These look so pretty as well as tasty. I love black sesame! 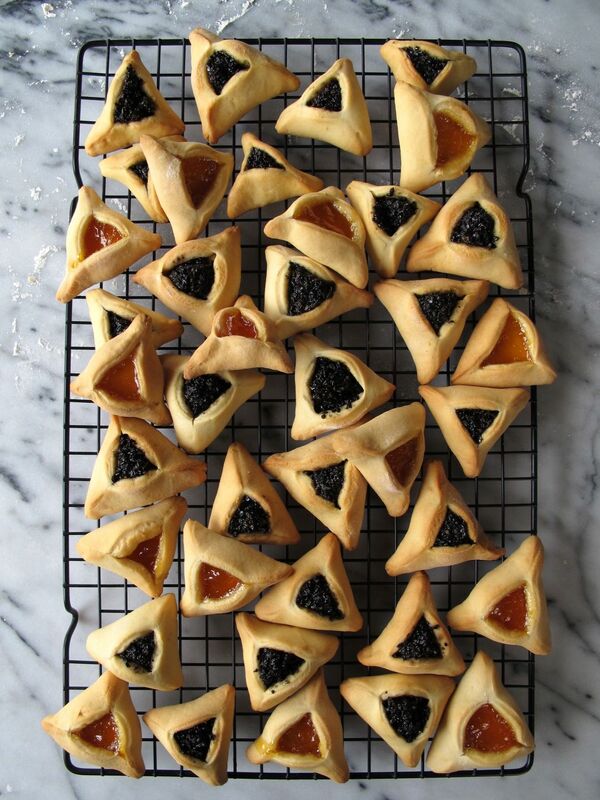 Will make these to surprise my Israeli friend!! Yum! 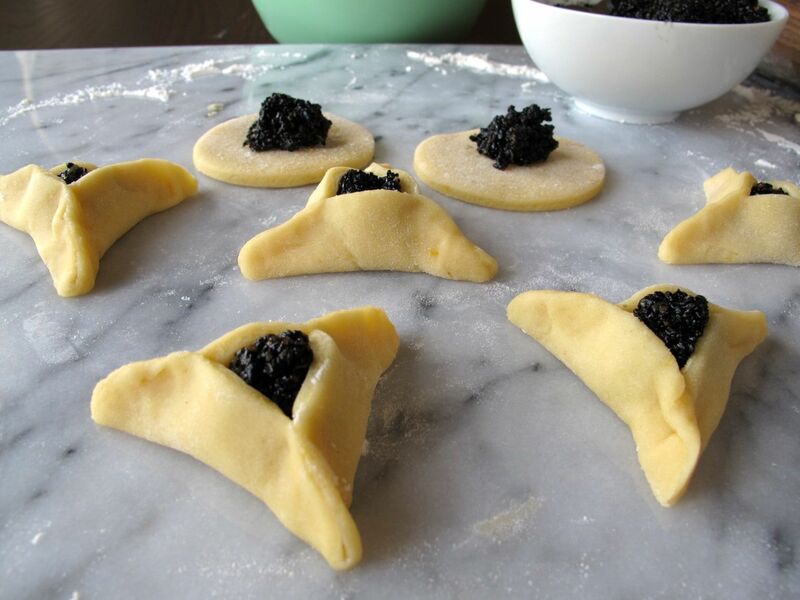 These look perfect and I love the twist with black sesame. Yayyyyy hamentashen! My faves. I totally need to work the instagram. I just hate social media. Black sesameeeeee yum. Gorgeous photos as usual. SO great to see you. I honestly get a lot of my news(/links to news articles) on facebook, so I’ll keep using it for that reason, but I’d rather look at straight-up photos on instagram (and I’d rather look at advertisements nowhere!). These look great!! I can’t imagine what they taste like, but I’m sure it’s good! Further reason I’ll have to try making them, thank you for sharing!! Thanks! They don’t taste all that different from the poppyseed ones because of the honey + lemon, but they do have a distinct nutty sesame flavor, which I love. Hope you get to try making them, and hope you enjoy! 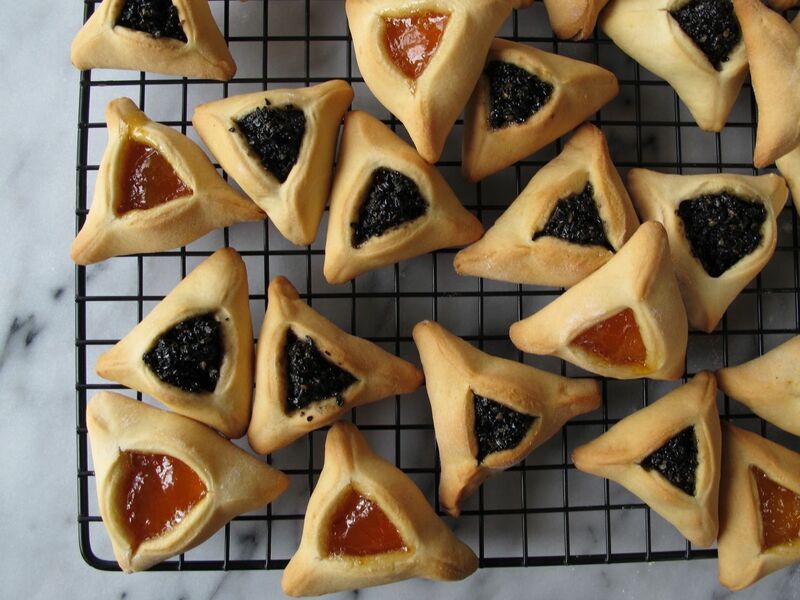 hamantaschen! i loved making these a year or two ago; so much fun to pinch up those little triangles, and i loved experimenting with the fillings. 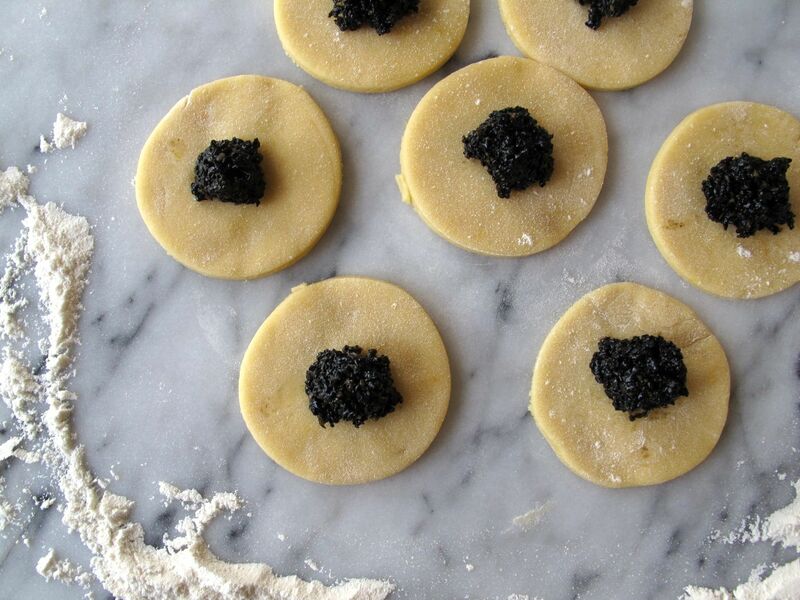 Confession: i’ve never tried the poppy seed filling, but i plan to, because yours look absolutely delicious.